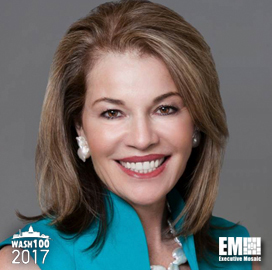 Executive Mosaic is honored to announce Teresa Carlson, vice president of Amazon Web Services‘ worldwide public sector business, as an inductee into the 2018 edition of the Wash100 — Executive Mosaic’s annual selection of the most influential voices in the government contracting arena — for her leadership in expanding cloud computing capabilities within the federal government. Carlson joined AWS in 2010 from Microsoft, where she served as VP of the technology firm’s federal government business. In support of intelligence community clients, AWS unveiled in November a new cloud region designed to host workloads and datasets with the “secret” classification status. Carlson said then that the AWS Secret Region will work to accelerate the delivery of critical data to decision makers and advance agency collaboration and national security efforts in support of intelligence community’s missions. “AWS now provides the U.S. Intelligence Community a commercial cloud capability across all classification levels: Unclassified, Sensitive, Secret, and Top Secret,” she added. In addition to the AWS Secret Region, the company also announced in June its plans to launch in 2018 a second region for its cloud platform designed to host regulated data workloads and sensitive information. The AWS GovCloud (US-East) Region will work to provide government clients with additional disaster recovery options and help them comply with several regulatory requirements such as the Federal Risk and Authorization Management Program and the International Traffic in Arms Regulations. AWS also announced this year’s winners of the City on a Cloud Innovation Challenge that seeks to recognize local and regional governments’ contribution to developing technologies for citizens worldwide. She noted then the challenge resulted in applications from cities, police departments, school districts and other partners that used data analytics, internet-of-things services and other data projects on the AWS Cloud. The company also unveiled in August an online marketplace – AWS Marketplace – on the company’s GovCloud U.S. region to help independent software vendors customize, maintain and update products for government clients that require regulatory compliance. During the company’s Public Sector Summit in Canberra in August, Carlson noted then that the company’s Australian operations would get infrastructure investments in an effort to meet the predicted client demand. “With infrastructure, we are never stagnant and are in constant evolution and build mode … so we innovate ahead of demand from our customers,” she added. In August AWS demonstrated the potential defense applications of Amazon Rekognition, an AI-based service designed to help software developers build image analysis applications. Executive Mosaic congratulates Teresa Carlson and the AWS team for their selection to receive this award.